9.08 mi. ; from MD 404 near Hillsboro northeast to MD 313, Greensboro. 5.13 mi. ; from MD 309 north to MD 304, Ruthsburg. Skirts the western edge of Tuckahoe State Park. 5.41 mi. ; from MD 27 east to Business MD 30, Hampstead. MD 482A: First St 0.04 mi. ; from MD 482 east to end of state maintenance. Main line unsigned, only the spur MD 485A (Shady Oak La) marked. MD 485 is a loop on the south side of MD 404, the eastern end near the junction of MD 404 and MD 312. You can see where this was the old 404; cracks along the shoulders reveal the old alignment. The biggest surprise though was at the eastern end, where a single 485 marker appears on a stub that dead ends at a private driveway. MD 485A: Shady Oak La. 0.15 mi. ; from MD 480 to dead end. Though a stub this is signed as 485. MD 486 and 487 are mentioned in a 1937 operating budget, but only by their numbers and their location in the town of Vienna. The town was otherwise known as the last 2-lane section along US 50 to be bypassed (now the two sections of MD 731). Connects MD 5 and 235. Did not appear as a state route until the 1970s. No longer assigned (decommissioned), route now designated MD 314A. A tiny sliver of Whiteleysburg Rd near the Delaware border. MD 314 forks left and becomes DE 12, the right fork is the former 489. It's now designated unsigned MD 314A. MD 489 shown on a 1948 SRC map. After decades in the state system in unsigned obscurity, MD 490 is finally signed in Havre de Grace. It's only at the two ends, but the whole route is only five blocks long. 6.78 mi. ; from MD 64 northeast to MD 550.
from 6 northeast to end of state maintenance near Baptist Church Rd. No longer assigned (decommissioned), entire route now part of MD 425. 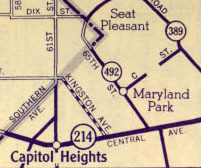 MD 491 shown on a 1948 SRC map. MD 492 entered the District near its easternmost tip. In the 1940s, 492 was named 65th St. Another case of road name changes in the DC suburbs. No longer assigned (decommissioned), now part of MD 302. By 1942 this number had been superceded by 302.
from US 40 southeast to MD 150. No longer assigned, number changed to 700 by 1948.
from beginning of state maintenance near Middle River bridge east to Eastern Ave.
No longer assigned (decommissioned 1942), number reassigned to Martin Blvd, renumbered 700 by 1948. Near its southeastern end, Martin Blvd (current MD 700) underpasses the Amtrak rail line. Prior to that, Orems Road provided a grade crossing to the west. Martin Blvd was assigned MD 493, and the part of Old Orems Rd was re-numbered 599 (and, opposite the tracks, renamed Baker Rd), while 600 (Old Eastern Ave) and 601 (Harrison Blvd) lie opposite the tracks. By 1948, Martin Blvd was renumbered MD 700, and the 493 number has vanished. Middle River area routes, showing the two MD 493s. 6.82 mi. ; from Pennsylvania border east to MD 63, Cearfoss. Becomes PA 75 across the line. MD 494 once ended at MD 57, and it was MD 57 that led to the PA border. On the eastern end, it ends on MD 63 about 100 feet south of the Cearfoss Roundabout (MD 63 and 58). Apparently some plan may have been made (and then killed) to connect 494 to Cearfoss Pike (the part west of the circle is no longer MD 58). A strip of land, which may have been set aside for this connection, is marked for sale through the MDOT real estate group. 42.03 mi. in Maryland; from Woodrow Wilson Bridge (DC line) counterclockwise to American Legion Bridge (VA line). Marked with inner & outer loops. I-495 has its own page in the Interstate section. Not likely to be confused with the Capital Beltway, being closer to Pittsburgh than Washington, MD 495 existed well before the Interstate system. This was a fragmented route until around 1948. It offers a second route parallet to US 219 to the Oakland/Deep Creek Lake area, and an interchange with I-68. MD 495A: Swantamount Rd 0.16 mi. ; between MD 495 and MD 135. MD 499 shown on a 1955 SRC map. MD 237 is now part of MD 234.